PreciFlex Corrugated Flexible Conduits come in a wide and comprehensive range of material variants to suit variety of applications. These conduits are manufactured in slit and non-slit variants based on the final application for wiring purposes. Polypropylene Flexible Conduits are the best solution for applications where resistance to constant flexing & vibration is essential. These conduits display excellent flexibility, moreover, they are light weight and easy to install which makes them very popular. Temperature resistant from -5°C to +90°C. Also available in slit type. Fire Retardant Polypropylene Flexible Conduits are self extinguishing. These conduits are manufactured from UL94 V2 rated material, ideally suited for automobile applications, wire harnessing, electrical wiring, cable protection & envelope to LPG gas conductors. Temperature resistant from -5°C to +90°C. Also available in slit type. Polyamide Flexible Conduits are manufactured from flame retardant & self extinguishing (PA6) material making them suitable for high temperature zones where human life or components are at risk, high resistance to corrosion by most mineral oils, acids & alkalis. They are widely used in automobile applications are have temperature resistance up to +200°C. Also available in slit type. UPVC Reinforced Flexible Conduits are manufactured with soft & hard UPVC spirally integrated in the surface walls. These conduits are abrasion – proof which makes them appropriate for use in mines, machinery, heavy equipments & industries. Temperature resistant from -5°C to +60°C. 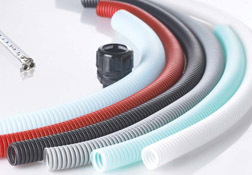 EVA Flexible Conduits are extensively used in washing machines inlet & outlet pipes & also in vacuum cleaners. Temperature resistant from -45°C to +65°C.